Now normally it really wouldn't be news if a player got bounced from an event. However, there are a few reasons for this article. First off, "Zeejustin" is a very famous (and infamous) online player, and second, the circumstances of his bust-out hand bear mentioning. From those of you who don't know, "Zeejustin" was one of the players that was caught multi-accounting way back when, along with "JJProdigy." 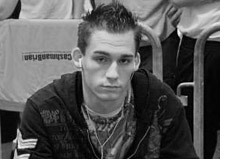 Bonomo paid a substantial price for his misdeeds, getting a significant amount of his poker bankroll confiscated, and in addition, faced a backlash from within the online poker community. Bonomo took some time off, and came back with a vengeance, setting the live circuit on fire, and has been doing extremely well in live events. Bonomo was cruising at the $2k No Limit Hold'em event today, and was the chipleader until he was dealt pocket Kings, and got all in against Will Durkee's pocket Aces. The Aces held up, and Bonomo was severely crippled, and was bounced on the next hand. The reason this is noteworthy is that Bonomo was bounced with the EXACT same hand at the PCA earlier this year, and ended up finishing 11th at that event. He was dealt pocket Kings, and got all-in against the pocket Aces of Isaac Haxton. Two extremely unlucky occurances for Bonomo. If his opponent is dealt any other hand in that circumstance, there is a good chance that Bonomo goes on to win either tournament. The good news for "Zeejustin" fans; he is an incredibly talented poker player, and will undoubtedly be back at many final tables.